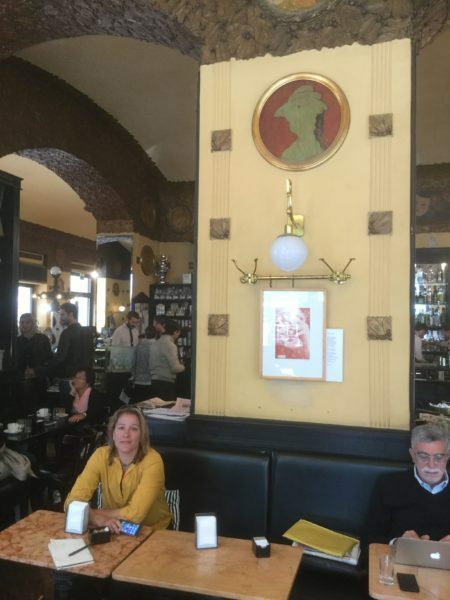 Europe is made up of coffeehouses, of cafes: places of assignation and conspiracy, for intellectual debate and gossip, for the flaneur and the poet scribbling in his notebook. “Draw a coffeehouse map and you have one of the essential markers of the ‘idea of Europe,’” wrote cultural philosopher George Steiner. Indeed, sir. America has its bars—dimly lit, jazz, bouncers– Ireland and England its pubs, but neither have chess-tables or newspapers hanging from rods for free perusal. 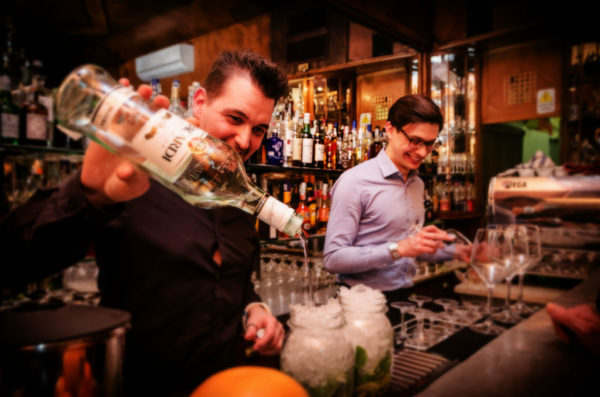 Across the continent, from Lisbon’s Café Brasileira to Rome’s Café Greco to Bucharest’s Café Caspa, coffeehouses are the agora, the loci of relaxed civility…the center of urban neighborhood life. And, for me, the center of these collective clubs of stimulative creativity are not the well-known beautiful coffeehouses of Paris or Vienna, but those truffled amidst the city of Trieste, the forgotten capital of European cosmopolitanism, a multi-ethnic, multi-faith gallimaufry of Italians, Austrians, Slavs, Germans, Slovenians, Roman Catholics, Greek and Serbian Orthodox, Anglican, Methodists, Waldesians, the true city of Mitteleuropa. Many of whom have their stammtisch, their regular table, at one of the city’s many coffeehouses. Ah Trieste. Tucked up in a far corner of northeast Italy, ribboned around two bays of the Adriatic, 70 miles east of Venice. Before the Great War, a larger, bustling city, the huge Hapsburg Empire’s only outlet to the sea, thus its wealth & substantial buildings, spacious streets, parks and gardens. Since, a city serene of 205,000 citizens, very lenitive, never to be a tourist-crazed magnet—no beaches or spectacular sights—but throughout a sweet tristesse that is onomatopoeic to the place…its “Triesticity” Jan Morris wrote in her incomparable book, Trieste and the Meaning of Nowhere. Trieste has a Prince Charles way of hand-in-jacket-pocket, anxious to be the picture of probity. Thus, a very pleasant place to begin our walking tour of its coffeehouses, diligent as bees. 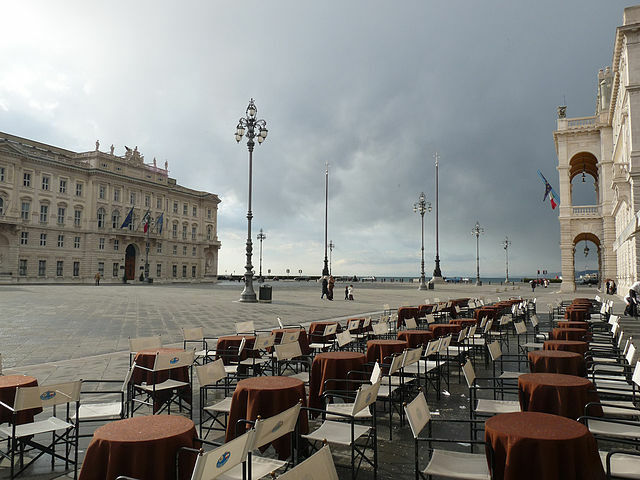 Beginning, naturally, at the Caffé degli Specchi looking out at the Piazza Unita, Europe’s largest square open to the sea, the “Café of Mirrors” still the real sitting room of the city. It’s a restaurant but also a café-confectioner that became popular in 19th-century Austria (Kaffeekonditorei). Outside seating facing the piazza is its glory; in the morning hours, the day’s menu grandly propped up in a red-velvet chair in front of all the other seats. A short walk north, turning left on Via Canal Piccolo toward the sea to the lovely Caffè Tommaseo (est. 1830) with its series of mirrors brought from Belgium, the wine bar and bakery/confectionary, its perky terrace facing the Adriatic. I advise ordering the Cappuccino Viennese Illy with whipped cream and cacao. Trieste, by the way, is Illy’s international headquarters, appropriate since here in 1904 Dr. Ernest Illy developed the first successful espresso machine, Italy’s greatest contribution to the coffee-drinking world. Continued “hitheringandthithering”, a Joycean word from the great Irish writer who lived in Trieste 10 years (1904-1914), up Via Corso Italia to Bar Torinese (est. 1919), a.k.a. Antico Caffè Torinese, a small, compact, its wood paneling reminiscent of a ship’s interior, for a quick “nero” (Trieste-speak for espresso), then left on Via Dante Alighieri a few blocks to Caffe Stella Polare (est. 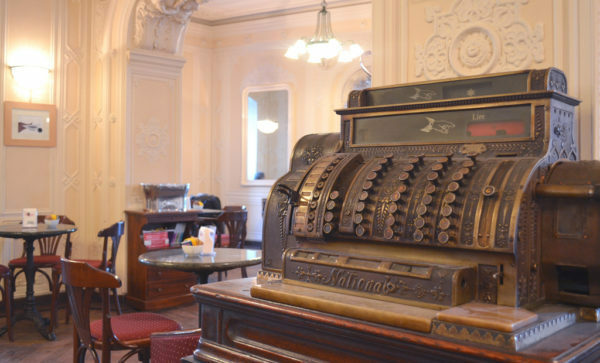 1865), a typical Austro-Hungarian café with classical decorations, mirrors, and, easily missed, a quiet Tea Room behind the gelato counter if front room seats are filled. Just across the Grand Canal, La Bomboniera, a comfit-confectioner-coffeehouse, home of Sachertorte, Slovenian sweets, krapfen (German doughnuts), beignets and bombolones. “The Lady with No Face.” Photo Richard West. The best for last after a walk northeast on Via Corso Italia, past the 1 A.D. Roman amphitheater below Cathedral San Giusto atop a hill, past Piazza San Giovanni, tipping hats to the large Verdi statue, and a few blocks stroll on Via Battisti to Trieste’s coffeehouse Valhalla, Caffé San Marco (est. 1914), for my money, the most beautiful in Europe: its Viennese Secession style, dark mahogany, Verona red-marble-table tops standing on iron legs with lion paws, Thonet bentwood chairs, intricately-carved wall. The portraits! The masked highway woman, the lady with closed eyes, the framed lady with no face. 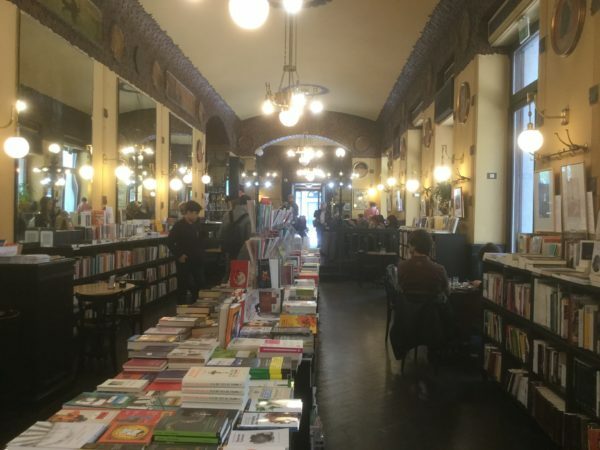 Entering you see not only a coffeehouse but straight ahead the Libreria Antica Caffé, long tables of Italian books for sale ending near an enclave for music events and lectures. Here, all cares vanish as the coffee is sipped, a book bought and read, the chess move pondered…the perfect place to wonder why garage band names sound like synthetic chemicals or villages scattered across Kyrgyzstan. …I recommend a balcony room overlooking the Adriatic at the Hotel Savoia Excelsior Palace, riva del Mandracchio 4, a five-minute walk to Piazza Unita. (www.starhotels.com). …Dinner: scrumptious Italian dishes at the cozy Trattoria al Collio, Piazza Venezia 4 (www.trattoriaalcollio.com). … On the city’s Grand Canal, drop by Souvenir Quel giorno a Trieste (12 Via Rossini) for the hard-to-find English-language “Trieste Historical and Artistic Guide” and the invaluable Quel giorno a Trieste packet of 15 map-brochures including No. 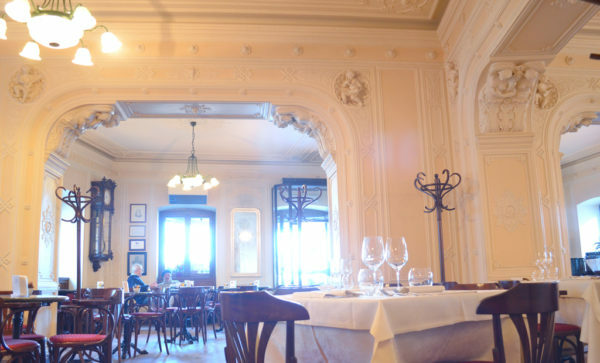 8, Historic Cafes. Good promotional article for Trieste. . . Topic worth more extensive coverage of variety i=of coffee houses, their clientele, activities, and their involvement in social life. . . Starbucks in the US is a relatively recent institution that attracts computer=carrying patrons and unofficial office for meeting friends, lawyers, accountants. . . Seventeenth century–Lloyd’s of England. Dubbed “KIraathane” in Turkey, it often is a male bastion where there might be some newspapers, but usually a hangout for many idle (?) men, a place where they can be reached. Safe(? )home of free speech? last year I heard that in Sinop, a harbor on the south shore of the Black Sea, women also went to coffee houses. . . As life changes, so do these establishments. From listening to sports events over the radio to watching them as part of a group, a temporary association, perhaps not to different from inns of old, minus lovernight lodging? 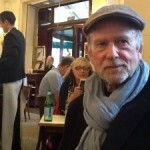 This man knows his Euro cafés. What civilized person does not appreciate an hour in a café with a book or a newspaper — or with a like-minded companion? Instead of travel-site listicles — useful as they might be — there’s a continent-wide travel book dwelling within his caffeinated compulsions and wanderings. He should write it.